Care for a banana? Just open your door and welcome the new frontier in retailing. NEW YORK (TheStreet) -- On a recent weekend I opened my door to a different kind of salesman. Zac Harrison is a partner with Fresh Harvest of Georgia, which has gotten into the business of delivering produce from area farmers to homes and offices. It's not cheap. Most of their packages cost $3/pound and more for things you might pay $1/pound for at a nearby market. But it's fresh, much of it is grown locally, and it comes to you. "We have a couple of refrigerated trucks," Harrison said, "small box trucks. We have a few routes each day. The same trucks do the pick-ups. We recycle our baskets." If you care about buying local, and supporting the growth of local produce, it's a good thing. Listening to Harrison, however, I felt like it was 1999 all over again. Back then an Internet start-up called Webvan came into Atlanta, offering grocery deliveries. I tried it. The delivery guy gave my kids bottled water. It was the first time they'd seen it. But Webvan crashed with the Internet bust. Can you really make money at this? Both start-ups and retailing giants now think they can. Can Apple Stop Defending its iPod Cash Grab? 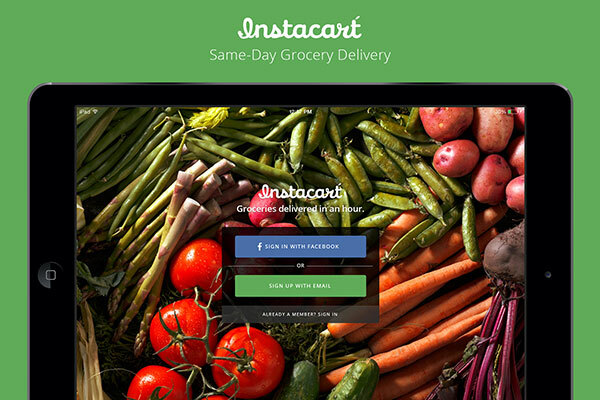 InstaCart is backed by almost $55 million in venture capital. They entered Atlanta in June, using an "infrastructure light" plan based on freelance "personal shoppers" going to local stores and an algorithm, like the Uber ride-sharing service, that matches their location to incoming orders. "When an order comes in, it batches the closest shopper to the store and the customer. Timing, location of store and customer, and shopper, all go into that," said city launcher Matthew O'Conner. Amazon (AMZN - Get Report) has Amazon Fresh on the West Coast, which for $299 a year will add fresh groceries to regular Amazon service orders, with same-day delivery. Walmart (WMT - Get Report) now has Walmart to Go. Google (GOOG - Get Report) launched a home shopping express service, with same-day delivery, in California and New York. Kroger (KR - Get Report) does both home delivery and offers pick-up services from some stores. The problem in scaling all these efforts up comes down to logistics, which shape each company's strategy. Logistics moved eBay (EBAY - Get Report) to not include fresh produce in its Shutl offer of same-day delivery after buying the UK-based delivery service in 2013. British logistics, however, will drive Walmart's entry, said spokesman Ravi Jariwala. "We operate as Asda in the UK and they've been doing this for over a decade. Our orders are delivered in specially built trucks with fresh, frozen and ambient storage sections. So your ice cream is frozen, your milk shows up chilled, and everything else will come without frostbite." Walmart does home deliveries only in the San Francisco Bay Area, but is getting good results offering pick-up services in Denver. Customers buy online, at regular Walmart prices, then pick up their orders free at the store, often at a drive-up pharmacy window. Selling at regular prices is a key to its future success, said Jariwala. Kroger is also building an offer on its own logistics, including online shopping lists with coupons, keeping things quiet by using local brands. King Soopers is the name offering home delivery of groceries in Denver. Harris Teeter, acquired in January, is continuing its pick-up services at 154 stores in the Southeast under the name Express Lane. Vitacost, an online vitamin retailer acquired for $280 million just this month, will become part of taking Kroger's online shopping services nationwide. With Vitacost, Kroger will offer customers the convenience of online ordering, home delivery, and an expanded assortment. All these players are preparing themselves for the expansion of Amazon Fresh, whose model is most similar to Walmart, and of Google Home Shopping Express, whose model is similar to that of InstaCart. Amazon's program is in trials on the West Coast; Google is also there and in New York, but both are expected to expand soon. Thus the next few years should see one of the biggest market battles in the history of retailing, but you won't have to leave your home to become part of it. Just click a mouse and answer the door. At the time of publication the author owned shares of AMZN and GOOG.